The sister city program originated in 1956 when President Dwight D. Eisenhower proposed a people-to-people citizen diplomacy initiative. Sister Cities International is the official organization that links jurisdictions from the United States with communities’ world wide. Currently Sister Cities International represents over 2,500 communities in 126 countries from around the world. The Sister City Partnership with Mombetsu, Hokkaido, Japan has endured for 50 years. A delegation of 15 citizens of Mombetsu, lead by the Chair of the City Council, Mr. Shibata, and the President of the International Relations Committee, Ms. Kato, traveled to Newport in mid May 2016 for the celebration. 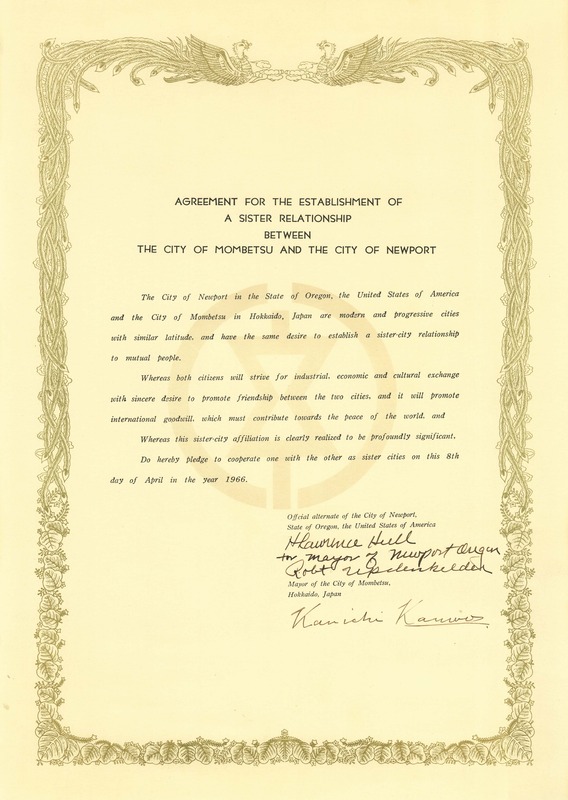 While they were here, the City of Newport held a special City Council Meeting. 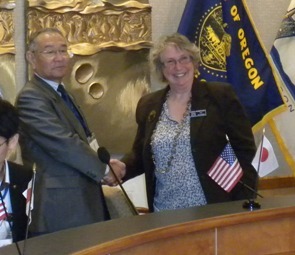 The delegation from Mombetsu were seated at the Council dais and sworn in as honorary city officials and citizens as a part of the ceremony. The Mayor and Council also gave the delegation from Mombetsu a City of Newport Flag and a special flag created to commemorate the Sister City Partnership. Outside of City Hall the official flag of Mombetsu was flown as well while the delegation was in town. The meeting moved outside to unveil a monument in honor of the partnership, located in the back garden at City Hall. A cherry tree, the symbol of friendship, was planted behind the monument with a shovel of earth placed by each person in attendance. The delegation enjoyed many of the tourism sights of Newport along with several events to greet and meet with their long-time friends. After the special meeting, a pot-luck was held at City Hall with the host families and folks that have been involved in exchanges over the years. The second evening a barbecue was held on the bay front for those that were unable to meet the group at City Hall. The final evening of the visit included a formal banquet at the Hallmark Resort. The Mombetsu Delegation did a special presentation in kabuki theatre style. An original embroidery of the Garinko, their famous ice-breaker, and an original oil painting of Mombetsu in the spring time blossom, were given to the City of Newport. The art work is on display at City Hall along with a refreshed display of the gifts and documents from the past years near the front entrance.